Orville Hodge, center, stands among top Illinois politicians. 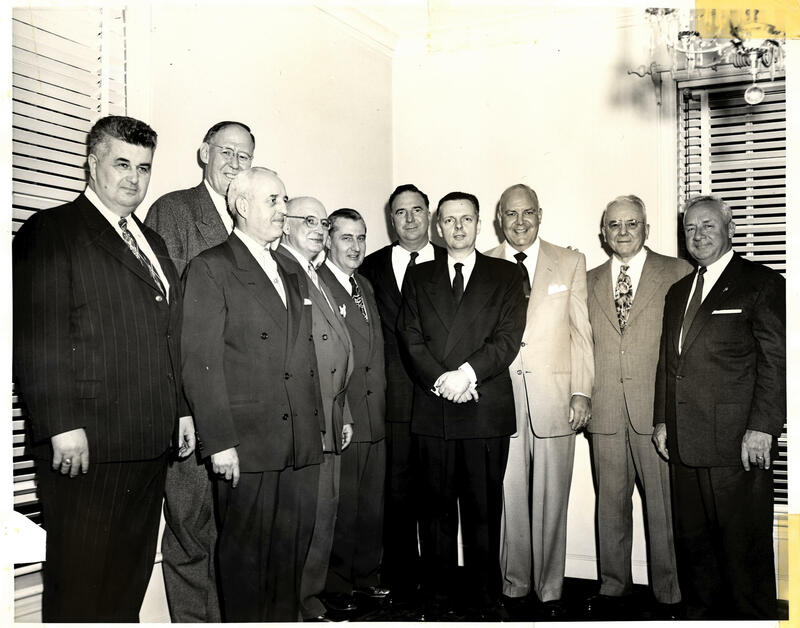 Among them, to Hodge's immediate right, is Illinois Governor William "Bill" Stratton, who served from 1953 to 1961. Voters this fall are choosing who will occupy the state’s two financial offices: treasurer and comptroller. Even during campaigns, these positions rarely get much attention. In fact, their very existence usually comes into question in proposals to merge the offices into one. Years ago, one person was in charge. It all changed after a massive scandal filled with fast moves, fancy cars and fraud tarnished state government moneyhandling forever. Listen as Sam Dunklau explains the origin of the Treasurer-Comptroller consolidation debate. Let's go back to 1970. Illinois was in the midst of a Constitutional Convention, and delegates from across the state were rewriting the rules of state government. It hadn’t been done in nearly a century. Special focus was given to who would handle state finances. That’s because Illinois had recently been robbed blind. “They were dealing with a history that involved massive embezzlement by one of the elected Auditors of Public Accounts,” said Political Science professor Kent Redfield. He’s a leading expert on Illinois government and its history. The name that’s crucial to all of this is Orville Enoch Hodge, who held the now abolished auditor of public accounts office between 1952 and 1956. In just four years, he stole an estimated $6 million in taxpayer money, about $56 million in today’s money. “It was one of the early big public scandals because we had this run of public scandals, really from 1970 on, with all these governors going to jail," said Chris Mooney, a political science professor at the University of Illinois Chicago. He and Kent Redfield agree: Illinois has two offices for money-handling because Orville Hodge proved to be one person couldn’t be trusted. Hodge was raised in Granite City. Before getting into state politics, he inherited a business from his father and was a financial success. He was personable, outgoing and once called a “golden boy” of the Illinois GOP. Many were stunned to learn that a man who had so much had stolen so much. Here’s how he did it: As the auditor of public accounts, almost every dime Illinois government spent went through Hodge. He would check to see if the expense was legal, write a check, and mail them out. A lot of those checks were written out to him. The president of a friendly bank in Chicago would personally deposit the cash into a secret account. Once he had the money, Hodge spent it on more than two dozen luxury cars and two private jets. He bought pricey real estate in Illinois and Florida, and threw extravagant parties for Springfield insiders. To keep the legislature off his trail, Hodge handed out jobs and fudged his accounting records. And that, as Chris Mooney says, is a big problem. But it wasn’t difficult to do bad. And that’s the really mind-boggling thing about Hodge’s crimes: they were par for the course in Illinois. Pilfering of the state treasury, payroll padding and other graft was going on all the time. But the scale at which Hodge was able to do it made him unique. “Good Ol’ Orv,” as he was called, was eventually found out. Illinois investigated for decades to come up with a final accounting of Hodge’s theft. Kent Redfield says the scandal left uneasiness in its wake. So, when the auditor of public accounts office was brought up at the 1970 Constitutional Convention, Chris Mooney says the state just got rid of it altogether. "That led to these two offices, one being basically the one that has the checkbook and the other one that invests the money. That checkbook handler is called the comptroller. To ensure a Hodge situation would never happen again, Kent Redfield says both the treasurer and the comptroller have to sign off on state expenses, called warrants. But as memory of the scandal faded, so did memory of why Illinois has two financial officers. It’s faded so much that there’s been almost perennial talk of merging the comptroller’s office with the treasurer’s. It would take an amendment to the state’s Constitution to get it done, but some claim it could save Illinois millions of dollars a year. Redfield seems game for it. But Mooney’s a bit less optimistic. He says Illinois has a lot more to worry about than combining the state financial offices. “The general point is: who has got the incentive to put political time, and capital, and money and everything else, into this good government effort, versus other things they might wanna do?” he asked. Plus, those who believe in keeping the offices separate have history on their side. No one wants another Orville Hodge. Ball is a relative political newcomer. Following her CPA certification in 2016, she ran in that year’s State Comptroller election against Republican Leslie Munger and current Democratic officeholder Susana Mendoza. Ball currently works as a Senior Accountant at Noble Network of Charter Schools in Chicago. 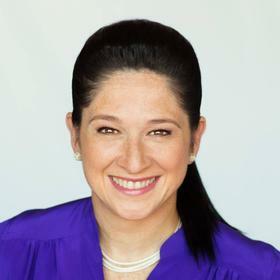 Mendoza’s political career began in 2001, when she was first elected to represent Illinois’ 1st District in the State House of Representatives. She held that post until 2011, then won Chicago’s City Clerk election in 2015, becoming the first woman to hold that office. Mendoza has served as Illinois’ Comptroller since 2016, having defeated then-incumbent Republican Leslie Munger. From 2009 to 2015, Senger represented Illinois’ 41st District as a member of the state House of Representatives. She left that post to run for Congress in Illinois’ 11th District, but was defeated by the incumbent, Democrat Bill Foster. 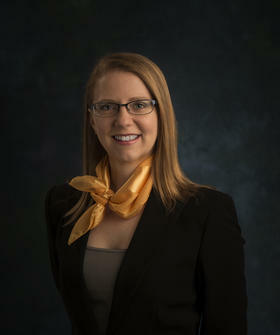 Before her time in the legislature, she was active in the private sector as a financial adviser and served on the Naperville City Council from 2002 to 2008. A retired sergeant in the Illinois National Guard, Dodge’s political career began in Orland Park, where he was elected village clerk in 1989. 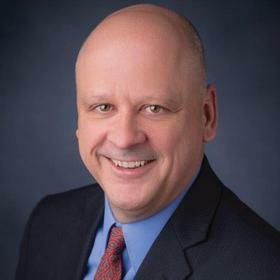 He was active in Orland Park government throughout the 1990s and now sits on its Board of Trustees. Dodge has also been senior vice president of the Nielsen Company. Dodge says he “knows how to grow a local economy” and is actively campaigning against “tax increases” and “burdensome regulations.” He points to his “30 years of private and public sector experience” as “uniquely qualifying” for a statewide office run. 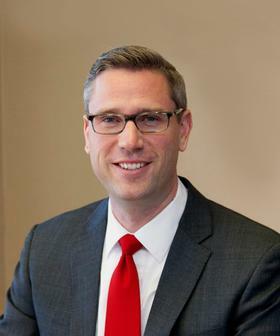 Frerichs has been active in state politics since the late 1990s. 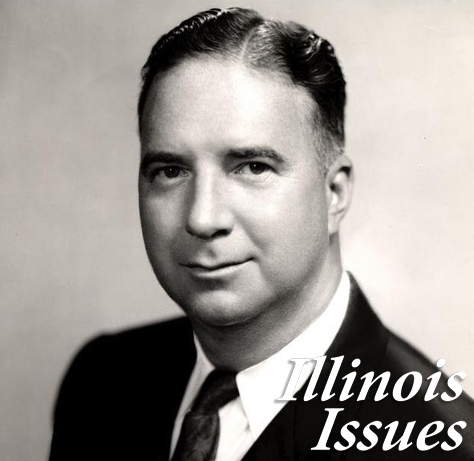 He ran two unsuccessful bids for a seat in the Illinois House of Representatives in 1998 and 2000, but won election to the Illinois Senate in 2006. He won re-election in 2010 and 2012, before narrowly defeating Republican Tom Cross in the 2014 Illinois treasurer election. Before his foray into politics, Frerichs ran a technology startup and served as a volunteer fireman. In a meeting with the State Journal-Register’s Editorial Board, Frerichs said he’d “more than quadrupled” Illinois government’s monthly investment returns during his first term, citing his office’s success in allocating state dollars to a greater range of investment vehicles. Frerichs’ campaign website states his “commitment” to being a “responsible steward of Illinois’ investments” and to providing more investment opportunities to families. Leheney, like comptroller candidate Claire Ball, is also a newcomer in Illinois politics. He began his financial career in 1999 at accounting firm PricewaterhouseCoopers. He’s also worked in the financial divisions of health care companies Baxter and Cardinal. 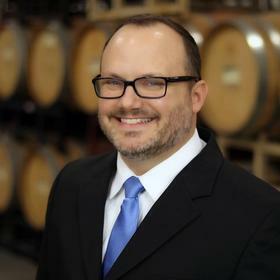 Leheney now works in financial analysis and treasury at Cooper’s Hawk Winery & Restaurants. Considering the legacy of the Orville Hodge scandal, ethical and accountable management of taxpayer dollars has long been a hallmark of both the State Treasurer and Comptroller’s offices. Both offices are expected to work in tandem to keep a close eye on every public dollar coming in and going out of Springfield. Both must also provide detailed, publicly accessible financial records so Illinois residents can easily see how their money is being spent. Other fiscal responsibilities, like preventing fraud and eliminating wasteful spending or practices, are also central to this issue. Susana Mendoza: “My office and I are shining a light on the state’s finances like never before. Because transparency breeds accountability, I will continue using every tool at my disposal, including my knowledge of the legislative process, to be a watchdog and create greater transparency of our state’s finances. 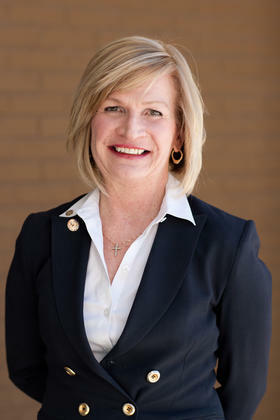 Darlene Senger: “I want to bring politics out of the Comptroller’s office, since it is an independent office. I want to create more transparency in regards to educating what the full debt of the state is, and be a watchdog for the audits and everything we can within municipalities. I will promise you that, if elected, I will serve 4 years. That’s my transparency right now.” - September 18 Chicago Tribune Editorial Board meeting. Mike Frerichs: “When Treasurer Frerichs was Champaign County Auditor, he was recognized by a national organization (Government Finance Officers Association) for his efforts to bring accountability and transparency to county finances. He received the Certificate of Achievement for Excellence in Financial Reporting every year he served as County Auditor. While County Auditor, Treasurer Frerichs achieved the designation of Certified Public Finance Officer (CPFO), which he currently maintains. As UIC Professor Chris Mooney explained, the state treasurer primarily invests taxpayer money brought into Illinois’ coffers, while the comptroller controls the checkbook, paying the state’s various bills, which are known as expense warrants. Each job requires careful management of complex payment and investment systems across a network of individual state employees. The state comptroller and treasurer also aim to find ways to make state dollars go further for longer, and work directly with the Illinois legislature to improve state government’s fiscal policies. Mike Frerichs: When asked at a September 17 SJ-R editorial board meeting how this issue squares with similar responsibilities as a state legislator, Frerichs said “the obvious answer is you’re an executive; you get to make decisions,” whereas just having ideas as a legislator. “As an executive,” he said, “I came in and decided I wanted to improve our college savings plans. I sat down and talked with our advisers and investment manages and said we’re gonna make some changes. We made them! If you really want to affect change, and you want to do it quickly, and you don’t have a lot of patience, executive office is a much better place for that. I think the public expects results [from the Treasurer’s office], and I think we’ve delivered in the four years I’ve been in office. Mike Leheney: NO. According to an August 30 Chicago Tribune article, the Libertarian candidate said “seeking to combine it, [the Treasurer’s office], with comptroller would eliminate a source of “checks and balances” and deny voters an elective office.